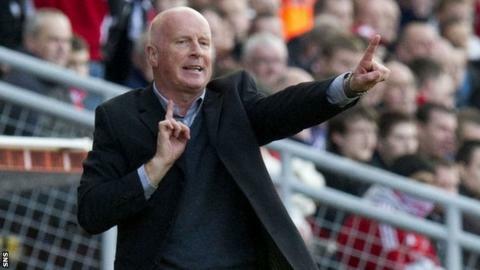 Dundee United manager Peter Houston described his team's entertaining 1-1 draw with Aberdeen at Tannadice as "a cracking match". "It was a ding-dong battle and for a derby match it was a decent game," said Houston, whose team remain second bottom of the Scottish Premier League. "I've got lots of positives compared to a couple of weeks ago at Inverness. "It's a stepping stone for us at United to make sure we're dogged and hard to beat and that's what we were." The United boss was referring to United's 4-0 defeat by Caley Thistle at the end of September, a defeat typifying their poor run of form. Indeed, their last SPL win was against Dundee on 19 August. United workhorse John Rankin gave the home side a first-half lead but their advantage was wiped out eight minutes into the second half when Niall McGinn beat goalkeeper Radoslaw Cierzniak with a tap-in at the back post after Dons captain Russell Anderson had headed on a corner. "I thought we had the better of the first half, Aberdeen looked dangerous in the second half," Houston told BBC Scotland. "But the best two chances of the second half came to us - Johnny Russell's strike that Jamie Langfield saved, and then how Keith Watson's was stopped on the line, I will never know, but that is credit to Aberdeen. They defended it properly. "I'm disappointed to lose a goal from a set play because we got a warning in the first half when Mark Millar cleared off the line from a Russell Anderson header making a run across the front post. "I spoke to them at half-time about changing Jon Daly's position. We didn't do it and we lost a goal. "We had decent pace through Stuart Armstrong and Michael Gardyne, trying to pick up the ball between the back four of Aberdeen and their midfield. "And we had Johnny Russell back to the form we know he can produce. He worked two experienced defenders very hard. "We had legs there and we caused them problems."